The SS Norway, the majestic classic ocean liner turned cruise ship, was severely damaged in late May 2003 while at the dock in Miami. In August 2006, the Norway was beached at the famous ship scrapyard at Alang, India, and workers completed the scrapping of the SS Norway in 2008. Although the SS Norway will never sail again, this profile is a testament to this legendary ship. The SS Norway was one of the last true classic ocean liners, having been built at Chantiers de l'Atlantique in St. Nazaire, France, and christened the SS France in 1962. The SS France was a no-expenses-spared maritime showpiece of French culture. The France was such an important construction project that it was closely monitored by French President Charles DeGaulle. Upon its completion, the SS France was considered a masterpiece of maritime architecture, and its restaurant was regarded as among the best dining options in France. At one time, the SS France was the world's largest ocean liner, and at 1,035 feet is still one of the longest built in the 20th century. She carried more than 2,000 passengers and weighed in at more than 76 tons. Although the ship was more than 40 years old at the time she stopped carrying passengers, she was still a head-turner with her sleek look. The ship's deep draft (35 feet) required her to anchor and tender passengers ashore in almost every port. Although this is a hassle, it did give those on shore a great look at an impressive ship. Her first 12 years were spent crossing the Atlantic as a speedy ocean liner, ferrying passengers to and from Europe and the United States. 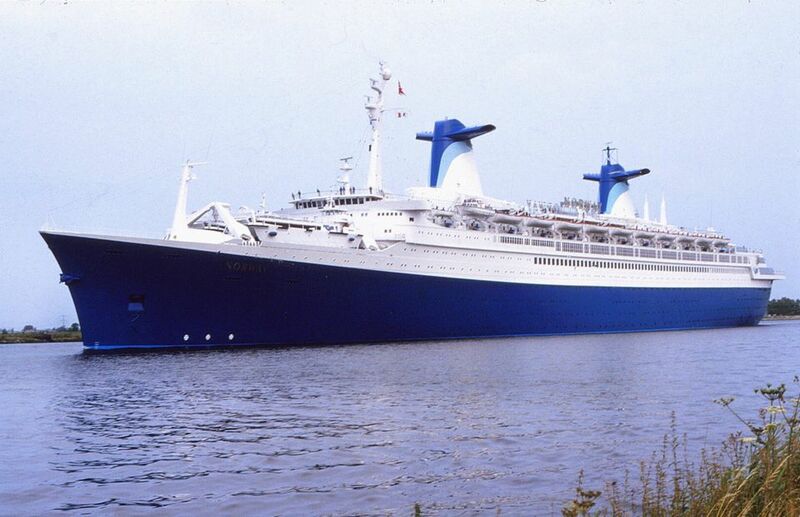 In 1979 Norwegian Cruise Line bought the SS France, renamed her the SS Norway, and significantly modified the liner for cruise service rather than trans-Atlantic duty. The shipyard removed two propellers and four boilers, reducing the Norway's top speed from 35 knots down to less than 25. Many changes were made to the interior, including the elimination of the class system. This 1979 refurbishment was only the first of many modifications, re-fittings, and facelifts that the Norway had over the last two decades of her service life. An alternative restaurant, a 6,000-square-foot Roman Spa, a 4,000-square-foot fitness center, a Sports Illustrated Cafe, and a whole new deck of balconied suites were just some of the additions. Although the Norway was one of the oldest ladies sailing at the time of the 2003 accident, these modifications helped her keep up with her more modern competition. There were other signs of modernization on board. Internet computer terminals were added to the library. Although the two main dining rooms were almost intact from Norway's trans-Atlantic days, the menu was modified to offer a healthier cuisine. The onboard entertainment was praised as some of the best afloat and included Broadway-style shows in the main theater. Some things on the Norway never changed much. The cabin layout and the number of cabin categories were very complicated and somewhat of a holdover from the class system days. There was often a significant difference in cabin quality among cabins of the same category. Because of the age of the ship and the many changes in interior design, a cabin might reflect the fashion of the '60s, '70s, '80s, or the '90s. For example, one cabin might have contemporary decorations and a picture window, while some in the same class will only have a porthole and not reflect the current fashion in decor. These cabin complexities meant that guests and their travel agents had to study a deck plan when selecting a cabin. North American cruisers got a second chance to sail the Caribbean on the Norway in 2002. She was not modern and full of balconies like the newer ships, but cruise lovers who loved the traditional look and layout rejoiced when Star Cruises announced her return to Caribbean waters. Unfortunately, she never sailed again after the fire in May 2003, but her history is memorable. Oceania Riviera -- Upper Premium or Luxury?